I gave myself a fright today when I reached into my right pocket to find that my pen was not there. I quickly traced back in my head thinking of places I might have been upside down during the day, horrified that it might be lost. But no, I was pretty sure I had left it in my shorts from the night before, and I was relieved to confirm this when I got home. 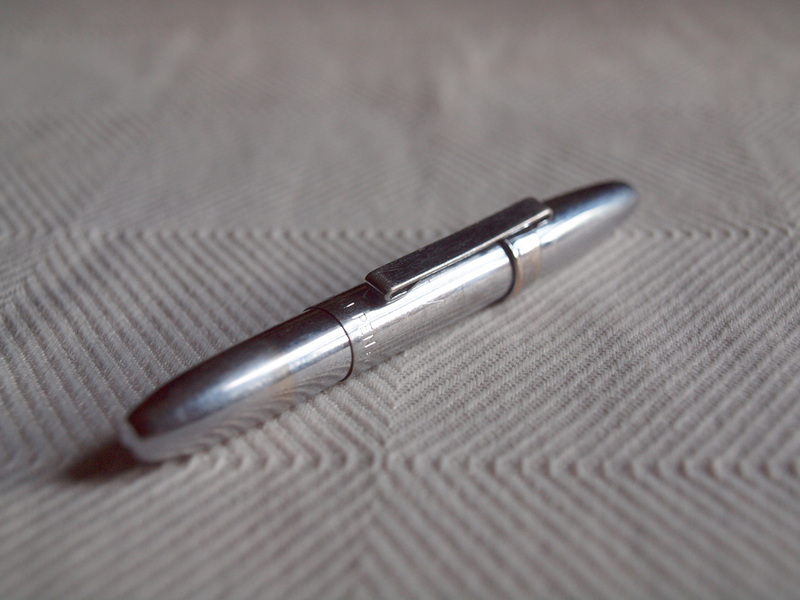 This is no ordinary pen: it is a Fisher Chrome Bullet Space Pen. And this is not an ordinary Fisher Chrome Bullet Space Pen, but one that my wife gave to me for my birthday while we lived in Edinburgh. Maybe a year or more prior I had expressed an interest in one, and while I’d forgotten about it she remembered, and managed to completely surprise me with one of the best birthday presents I’ve ever received. I carry it in my pocket wherever I go, which is easy and comfortable to do thanks to its compact size and smooth shape. I never tire of being able to answer, “Why yes, yes I do” when my wife asks if I have a pen on me. I tend to get emotionally attached to certain objects. They’re not usually outrageously expensive things, but rather well designed, well made, or in some way commemorative of an important event or time in my life. I am very attached to this pen, which is why every once in a long while my heart skips a beat when I discover it’s not in my pocket. Whenever I use it it reminds me of her, and how happy she was to surprise me for my birthday (no easy task, I assure you). We’re a few weeks away from our third anniversary, and I plan to carry this pen around with me until the chrome has worn through and the brass is polished by the inside of my pocket.